Positive Detroit: In The Works! New Community Garden And Farmers Market Coming To Detroit! In The Works! New Community Garden And Farmers Market Coming To Detroit! Wolverine Human Services plans to build a community garden and training site that will be cultivated by the residents of the streets surrounding the Wolverine Center and the John S Vitale Community Center. A community garden with raised beds and paved pathways for growing herbs and vegetables that meets ADA Accessibility regulations. 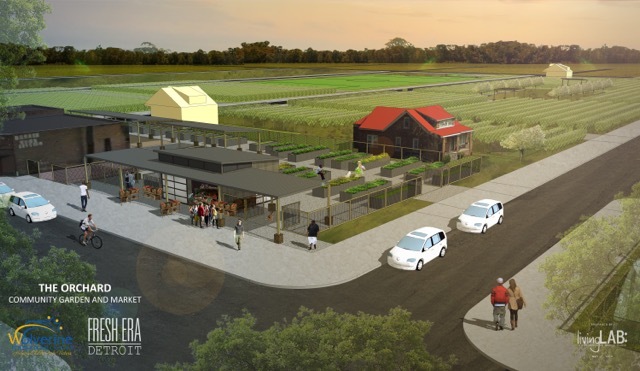 A mixed-use structure that will be used as a neighborhood farmers' market retail space, a garden-training classroom, and for agricultural equipment storage. The site will be well-lit and secured so that community members can work their garden plots in a safe and friendly environment. Wolverine Human Services has been an institution in the Jefferson-Mack neighborhood for nearly 30 years and in that time, we have witnessed the deterioration of this neighborhood as residents have vacated the houses and businesses and other community institutions have closed their doors. But here at Wolverine Human Services, we are committed to bringing new growth and innovation to this neighborhood by creating opportunities in the areas of education and vocational training to not only the young men in our care at the Wolverine Center, but also to the residents of the neighborhood that we have shared for three decades. Click HERE To Donate To This Project! If they hit their goal of $50,000, the Michigan Economic Development Corporation and Michigan State Housing Development Authority will DOUBLE your donations through their Public Spaces, Community Places grant match program.